I met Gyanendra Sahai for the first time in the bowels of the Lunar Geological Institute, in front of a display case containing an old-fashioned, heavy-built moonsuit. There was a large crack along one side of the suit and a rust-coloured discolouration along the opening. I was thinking about the pre-colonization days of moon exploration and the dangers that had beset the early explorers, and wondering what the story was behind this particular specimen (there was no label) when a mournful cough interrupted my musings. The man standing near me was gaunt, not tall, but with a presence that suggested height. His bald head was a baked brown dome, fringed with hair of a startling silvery gray; his eyebrows were of the same colour above heavy-lidded, lugubrious dark eyes. “Ah yes, the ill-fated expedition of 2031,” he said, shaking his head. I was delighted to recognize in his heavily accented English the speech mannerisms of Bihar, the state in India where I am from. Biharis are not very common on the moon. But before I could say anything about my origins, he launched into the story behind the space-suit. He had been there. He had been part of the 2031 expedition, along with an international crew of explorers. They had been mapping water resources on the moon, an essential requirement for the future settlement. While investigating the half-caved-in edge of a crater, they had found the entrance to a large cavern, such as had never been seen on the moon, and within it a body, possibly from some earlier mission, although the moon-suit was strangely constructed. The story involved the ultimate, mysterious disappearance of the corpse and the subsequent unravelling of the friendship between two of the team members, one of whom eventually took a hatchet to the other. What was perhaps worse, the databots containing the map of the water resources (and therefore of the location of the cavern) were destroyed in the melée. The expedition was called off, and only this tragic reminder remained. My new friend peered at the suit in the cabinet. He looked at me as though seeing me for the first time. His joy in finding a fellow Indian and Bihari was touching. He confided to me that having retired from exploration work, he had become a part-time consultant, and that he was weary of his present life. That is how Gyanendra Sahai came to live in Sinha Auntie’s boardinghouse, one of the oldest structures in Luna City. It is in the area known informally as the Ghetto of Selene, where, among the quaintly derelict remains of what was once the first human habitation outside Earth, the unfortunates, ne’er-do-wells, and poor university students of Luna City live. It is not really a ghetto, but the modern city, which rises just south of us, is such a dream of tall towers and gleaming polyhedral buildings that we look grimy and provincial in comparison. Sinha Auntie’s boarding house is a small place, with only five of us, including Sahai-ji—and not including our august landlady, who occupies (in a manner of speaking) the entire lower floor. The house is one of those dome-shaped prefab constructions from the early days of Luna City’s history, tough and durable; we have supplementary power via the giant solar panels on the roof, which stand atop the dome like a bad hair-do. We like the warren-like feel of the dome-house—the tiny rooms, rounded corridors, and most of all, Sinha Auntie’s incredible authentic Bihari cooking. She used to be a medical researcher in her younger days but is now content do that part-time. She rules over our little establishment, bullying us to study, making us do our chores. But she makes up for her totalitarian ways with her incredible Bihari cooking—jackfruit curry, nenua-chana sabzi, and pickled boiled potatoes, and pakoras that burn off your taste buds and leave you begging for more. We don’t yet know where she gets all the rare and expensive vegetables. All she says (with a giggle that shakes her vast and genial frame like a miniature earthquake) is this: Biharis may be few here on the moon, and we may spend most of our time arguing, but we do look out for each other. The addition of Sahai-ji brings the total Bihari contingent of the boardinghouse to three. The other boarders include Meena Sreenivasan, the mathematician and artist, who lives downstairs in a room off our landlady’s apartment because the latter has old-fashioned views; Kunaal Kapoor, a student of planetary geology, whose eyes are on Mars; Dave Pratchett, the sole non-Indian (he is American), studying sociology. We keep busy with our separate lives, but Saturday afternoons Sinha Auntie does a huge old-fashioned Bihari-style tea, complete with suji halwa, litti, pakoras, matar-ki-gugni, crisp-fried chura with sev and roasted peanuts, and the best tamarind chutney on the moon. Saturday afternoon is an occasion for the sharing of stories about the week, vehement arguments, and the occasional cushion-fight. I find it very pleasant, watching the graceful arc of the cushions in low gravity, listening to the animated, expressive Meena Sreenivasan talk about art or mathematics, while Kunaal tries his best to be as unpleasant as possible. Dave puts in a word or two, uncoiling his lanky frame to reach the matar-ki-gugni, his eyes swimming with happy tears as he chokes on a chili pepper. He’s earned the sobriquet of Spy, partly because we Indians are compulsive nick-namers, but also because nobody understands what he’s doing in this low-tech boarding house with a gaggle of Indian students. He claims it is the food that draws him, but we wonder. I was somewhat nervous about Sahai-ji’s reaction to our Saturday afternoon free-for-all; and indeed the first time he kept quiet, his large eyes mournful as he wrapped his fingers around a pakora. The others were polite, in deference to his age and stature, but after some time they forgot the niceties and broke into heated debate. I had to intercept the cushions a few times so that they did not strike our new tenant’s elderly pate, for which he gave me a grateful smile. Sometimes it seemed as though he was on the verge of saying something, that words of great import were trembling on his lips—but he would change his mind and remain quiet. I found Sahai-ji fascinating, and tried to draw him out in private, but he seemed reticent about his past, despite his earlier volubility. I was supposed to be studying for my finals (I am studying lunar botany, a fascinating field), but instead I would I would find myself thinking about Sahai-ji, wondering what he had endured, why, in his eyes, there was always a look of perpetual melancholy. Somehow I would have to draw him out, see what other stories he had to tell. I only had to wait until the next Saturday tea. Kunaal snorted. He has the practical scientist’s scorn for theorists and pure mathematicians, especially mathematicians who indulge in art. The first cushion flew. Dave caught it neatly. This was a clever move, since Kunaal and Meena are the physics and mathematics experts, and both love to talk. I glanced at Sahai-ji and was disappointed to see that he was apparently asleep, lying back in the room’s most comfortable chair with a print-out of the daily news feed covering his face. The pages rose and fell with his breathing. The ruins of a vast tea lay on his plate. We listened to Meena and Kunaal expound. 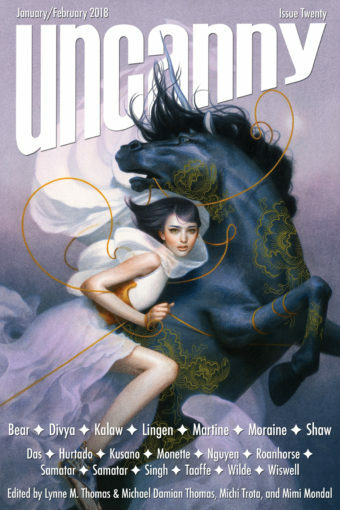 Briefly, Delgerbayar, the brilliant Mongolian theorist who was the latest glamourous addition to Lunar U’s physics department, had come up with a new theory. His Universal Field equations exhibited interesting symmetries that had ultimately led to the theoretical possibility of a hyperspace (and hence faster-than-light travel) and the existence of a multiverse—that is, a succession of universes that branched off the base hyperspace as bananas branch off their central stem. According to the theory, some of these universes were startlingly like our own, with a few properties reversed. Delgerbayar had dubbed these “mirror universes,” and since the symmetries of the equations were not perfect, he had speculated that mirror universe space-time occasionally leaked into our own, causing the anomalies that physicists had recently observed. “I don’t have a pimple!” Meena said fiercely, touching her cheek with one hand. “It’s all right, Meena, it’s probably a bit of tamarind chutney,” said Dave soothingly. Meena glared at him. He covered his face with his hands. “I’ll show you jokers what I mean,” said Kunaal, taking down a picture from the wall. It was a rather boring abstract still of an unmoving geometric landscape. There was a rending sound. The picture frame had cracked. “Sounds like garbage,” Kunaal said. I sometimes think he was born scowling. He drew breath in to make his speech, when he was interrupted by a gale. The pages on Sahai-ji’s face blew off and on to the table. It took me a moment to realize that the breeze was an exhalation, a long sigh that no human pair of lungs should have the capacity to execute. Sahai-ji coughed, sat up and looked at us out of his tragic eyes. “Conservation laws,” he said, and sighed again. We stared at him in stunned silence. We waited. Almost on cue, Sinha Auntie came in with fresh pakoras and a vat of her killer mint chutney. Sensing a story, she settled her ample form into the second-largest chair and made herself comfortable. I was born Gyanendra Sahai in a small village in Eastern Bihar (he said). All my life, my ambition was to explore the unknown territories. When I finally got sent to the moon, I was happy. But that expedition ended in tragedy, as Vikram here knows. (The others gave me startled glances). I had the chance to return home after that, as there was much sympathy for us. But I was infected with the space bug, and volunteered to go on a mission to Mars. My conduct during the Lunar expedition of 2031 had impressed my superiors so there was no problem. At that time there was no large settlement on Mars: small habitation domes were being built for the scientists and explorers. I was sent to one such place near the Vallis Marineris. This is not a story about Mars, although it begins there. Nor is it about the Moon or Earth. Makes you wonder, doesn’t it, since these three are the only inhabited worlds? Well, then, listen carefully, because this story is known only to a few. You may have heard, if you have studied Martian history, that many of the early explorers died. There are reasons enough—Mars is a hostile place for Earthlings. But there was also a persistent rumour that some of these old explorers had not died but simply… disappeared. When the International Space Council took over operations in Mars and said that you cannot do this or that but you must obey our rules, some of the old timers simply faded into the famous Martian dust haze. They call them Ghosties. There are all kinds of stories about the Ghosties—that they retreated into secret habitats, found ways to survive that allowed them their freedom. Now most of these stories are probably fabrications, but it had been reported that a lone person had been seen in the area near my camp. So as part of my exploration duties I was told to keep watch and see if there was really someone out there, a ghost from the past. This was also around the time that anomalies were first being reported—aha, you think Delgerbayar’s anomalies are a recent phenomenon? Nonsense! They were first reported around that region of Mars. Peculiar things were happening. Sudden flashes of light in the air. Strange temporary illusions, such as the time my friend Jack Moray’s eyes got switched—he had one blue and one brown eye, and one day, I swear, they had apparently swapped places. There were optical distortions, such as the kind you get in a heat haze, except there was no heat haze. You looked at the pale sunlight hitting a rockface, and you’d see a shadow where there should be none. These anomalies shifted, appeared, and disappeared. One time the ground shook, and there was a rockfall. Mars, as our young friend here will tell you, is not exactly seismically active. The people in my team were, as the Americans say, spooked. Perhaps it was no wonder that they imagined the silhouettes of long-dead Martian explorers on distant cliff-tops. In fact the first time I saw such a figure, I thought I was going crazy too. I was camped in a high, dry valley, between two towering cliffs. I was making some geological measurements on behalf of a team member who was sick and had returned to Base. It was comfortable enough in my little mobile habitat, which was fully sealed from the harsh Martian environment. I had completed the measurements, which had taken three sols, and was within sight of the habitat when I saw him. He wasn’t far away. He was up on a ridge, against the cliff face, attired in a bulky, old-fashioned environment suit, capering about like a madman. I would not have noticed him had not the setting sun glinted on his visor. For a moment I staggered, thinking I must be hallucinating. But soon I realized that what I was seeing was real. I shouted out to him, forgetting that he would not hear me. Then I began climbing up the cliff-face. I think he saw me then. When I looked up in mid-climb, he was gone. That night I set out some food from my rations on a rock near my habitat. The next morning it was gone. Now I was in radio contact with Base, but I did not want to tell anyone as yet about my discovery. I was sure that the others would rush up here and want to investigate, and my quarry might be scared off. I imagined that it would be much better to befriend him and bring him triumphantly back to camp. So for the next two sols, that is what I did. I left food out, and all of it was taken. I wondered how the poor fellow lived, without an assured supply of food, water, and breathable air. I wondered how he recharged his environment suit. It seemed to me more and more likely that there must be a hidden camp of survivors like him, deep in the maze of this part of the Vallis Marineris. Perhaps they made their own oxygen, grew food in hydroponic tanks? I was determined to find this hideout, if it existed. Ah yes, there is nothing like roasted gram and suttoo sweetened with gur (he said). When I was a child growing up in Bihar, I would run off the whole day, playing with the buffalos in the rice fields, or looking for ber fruit in the forests. My mother would tell me every morning that even if I went to the stars, I should take some suttoo or roasted gram with me. You never know when you need the extra energy, she would say, not dreaming that one day her wayward son would actually go off to the stars. Anyway I’ve followed her advice ever since. I even brought some roasted gram and suttoo to Mars. Now back to my story. Finally the day came when I was able to entice the fellow into my habitat. There I encouraged him to take off his helmet, which he did, revealing a face so burned and scarred (presumably from radiation) and so obscured by a full beard, that I could hardly make out his features. Only his eyes were visible, small, round, and glinting. The poor fellow was completely mad, spouting gibberish and executing his peculiar dances. I could not place his nationality, except that he was definitely not Bihari, for when I offered him some of my precious roasted gram he peered at it as though unsure it was edible. Nor was his speech of any mortal tongue. He seemed to want to tell me something, and kept wheeling his arms at me and pointing out at the cliffs. I imagined then that he wanted me to follow him, to show me his secret hideout. Much excited, I left a cryptic radio message for my team at Base, saying that I was going to be gone for a while but that I was on the verge of a great discovery. Then I set out with him. He took me over a torturous path between the cliff faces and mesas. I was certain I would not remember the way back, which was why I was glad I had brought my little geobot. This bot communicated with the then-new Martian satellite network so that I always knew where I was (unless I was in a particularly deep and narrow canyon). The geobot was autonomous, moving on little robotic legs like a round-bodied millipede. My companion kept giving it looks that I could not fathom—once he bent down and patted it like a dog. I imagined then that it brought back memories of some long-lost pet. Suddenly his face, behind his visor, widened into a grin. In a swift movement he grabbed the little bot, gave me a mischievous look and darted behind a jutting rock-face. Alarmed, I cried out and ran after him, but he was always a few steps ahead of me, darting up and down the rocks like a mountain goat, grinning and leering at me, and pretending to drop the bot off the two-mile-high cliff edge. Finally I saw him run into a crack in the opposite rock face. I followed him, my breath coming in frantic gasps. As darkness closed around me, my suit lights came on automatically and I saw that we were in a warren-like passageway. The walls were smooth and rounded, and the ceiling high. I was struck with wonder. It would have been nearly impossible for a tribe of derelict old explorers to cut such a wall, yet it was clear that the passage was artificially made. This brought to my mind half-remembered tales I had read in childhood, of an intelligent Martian race. Was I being taken to some vast underground city, where aliens dwelt? As it turned out, I was wrong—but not quite. Our race ended in a round chamber. Still holding the bot as though it were a baby, my quarry stopped, and hit a spot on the wall. Immediately and soundlessly, a great slab of stone moved across the passageway entrance, closing it off. The words died in my throat. I saw that there was a soft glow coming from the walls, which were covered with strange symbols carved into the rock. In the middle of the floor was a round pedestal made of some kind of silvery metal. As I gazed about me in wonder, I noticed that the madman was taking off his suit. There he was, naked and ugly as the day he was born. He indicated to me that I should also divest myself of my suit. I was about to refuse when I saw that the fellow seemed to be quite comfortable. He was breathing just fine. My suit registered an outside pressure of 1 atmosphere. I opened my airlock cautiously. The air smelled slightly pungent, but I could breathe. Curiously I stepped out of my suit. For the first time I stood outside a habitat on Mars in my normal clothes. A sense of adventure was beginning to replace panic. My companion now indicated to me that I stand on the pedestal. I did so, hoping to wrest my bot from him. But before I could do anything, thick, membranous rope-like curtains—I can think of no better term—shot out from the walls and enveloped us. I screamed and struggled, but the sheaths wrapped themselves around my body completely from head to toe. I must have blacked out after a while, because when I came to, I was being dragged, not ungently, toward an opening in the wall of the chamber. I realized suddenly that I was still breathing, and that I could see through the translucent sheath. My skin tingled wherever it was bare—the membranes appeared to be putting out little roots that tickled the skin. I struggled to my feet, tearing at the sheath with my hands, which, being also covered by the same material, could not get a good hold. In my terror I heard voices inside my head, speaking languages I had never heard before, but I could almost understand. There were pictures in my head of giant spinning wheels. The madman pulled me toward a great metallic structure that took up most of the room in the other chamber. How can I describe my first glimpse of that artifact? I stood there, struck dumb. It was a vast wheel-shaped object, perhaps twenty metres in diameter, with a silvery lustre. The wheel had no rim, only eight motionless spokes. Inside the hub was an open, hollow space. What manner of life had come up with such a device? What was its purpose? Again, fear ebbed, to be replaced by curiosity and awe. I reasoned that whatever this device did, it could not be harmful, for my companion had survived it. I imagined bringing news of this great discovery to all humanity. So I did not protest when my companion led me to the space inside the hub. We stood there like two mummies. I saw that the fellow still carried my bot, which was not covered by the membranous sheath. So the mechanism in the first cave was intelligent, knowing the difference between life and non-life. It was also able to discern the needs of human beings, such as the kind of air we needed to breathe. Did this mean that the aliens who had devised this were like us? Or just that they had kept the needs of other species in mind? My mind swam with strange images as we waited, for God knows what. Then, slowly, the chamber began to grow dark before us. I could now see more clearly the images that had been clamouring for attention in my mind. I saw vast fields of stars and all manner of strange beings. I saw strange and wonderful worlds, and pathways in utter darkness, that led to distant universes. I was reminded of the story where Krishna’s earthly mother, Yashoda, happens to look into the child’s mouth. There she sees the entire cosmos, and at that moment she knows who her son really is. That is how I felt, beholding the vistas that no other human being but my companion had ever seen. At that moment I only half-understood what I was seeing, and only later was I able to form a hypothesis or two about my experiences, because what happened next was so fantastic I thought it was a continuation of the images projected in my brain. Only when the image persisted did I realize that we had been transported to an entirely different place. We were not on Mars any more. We were still in the hub of a vast wheel, but this wheel was suspended in space, with the rimless spokes turning slowly. Before us, in every direction, was an enormous array of such wheels, stretching into space as far as I could see. The darkness between them was not speckled with stars, but was a true darkness, as would be found, perhaps, in the gulf between the galaxies. Yet the giant wheels seemed to be glowing faintly, and from the ends of each spoke I could discern a pulse of some sort emerging at fixed intervals. The wheels hummed and sang; although I could not hear them in the vacuum, I heard their song in my mind. We were afloat in the middle of the hub. I touched the wall carefully, and found protuberances that served as handholds. Very slowly I brought myself to the edge of the chamber, in order to better observe this great vista. I was aware of my companion beside me, his mouth opening and closing behind the translucent sheath as he babbled soundlessly. Although there was no gravity to make me fall up or down, I momentarily felt sick with vertigo. I clutched the edge of the hub, rotating gently with the wheel, making no sudden moves. Newton’s Third Law could have fatal consequences. Now I could hear what the alien voices were telling me inside my mind. The music of the wheels swelled to a crescendo and back again to a soft murmur, in a regular rhythm like the heartbeat of a great beast. As the wheels turned, an energy field of some kind was generated—I could sense the invisible hills and valleys. The light beams from the ends of each spoke of each wheel crisscrossed, forming areas of light and shadow. I realized that in order for me to see the beams at all, the space around me must be filled with something that could reflect light. Interstellar dust? Or was it the strange emanation itself, that I called, in my ignorance, the energy field? I also saw, to my utter surprise, that there were light beams that appeared to have different properties. Some simply intersected each other and continued, the way that two flashlight beams in a dark room intersect. Others, when they intersected, appeared to stop at the point of intersection, which created a dark spot. This great, undulating display of ordinary and extraordinary light (or whatever the radiation was—there could have been frequencies beyond the visible) somehow was responsible for the energy field. My mind was flooded with images and symbols that I later pieced together. Although there is much I can never understand, it became clear to me that this whole spectacle had one purpose: to prevent two distinct universes from crossing each other. Apparently this place was a potential crossing point. The other universe was similar to our own, but for some attributes. I believe it was a universe dominated by anti-matter, as ours is by matter. But it was also dominated by this other form of light, which I dubbed anti-light. Think about it, my young friends—what is the opposite of light? Not darkness. Darkness is the absence of light. No, strange as it might seem, its opposite is anti-light. An anti-photon can form a bound state with a photon, like an atom—an atom of light!—or the two can annihilate each other, releasing an exotic form of energy. The great wheels, spinning in concert as they did, must have been designed by some wise alien race. I doubt they were Martians. They had been to Mars and built the portal to this place, but their dwelling place was elsewhere, I was sure of it. Where they were now, I could not say, but they spoke directly to my mind through the sheath that I was wearing. They had built this vast array to save our universe from destruction. It became clear to me at that moment that the anomalies we had observed on Mars must be the result of some kind of malfunction of this protective array, because the strange optical effects we had seen could only be explained by anti-light leaking in from a mirror universe. What could have caused the malfunction? The answer came to me almost as I thought the question, because at that moment my mad companion, whom I had quite forgotten in my contemplation of the marvels before me, suddenly launched himself off the edge of the hub. He shot into space even as I cried out in consternation, for the entire wheel shuddered. I could sense that the regularity of the emanations was disturbed; the array as a whole appeared to tremble, and the scene distorted before my eyes. Then the whole thing adjusted, like a rubber band that has been pulled and released. As my vision cleared I saw the fool sitting inside the hub of the wheel across, gesturing and grinning at me, still holding the bot. He did it again, launching himself from hub to hub, each time causing a perturbation of the array. Each time it adjusted, but every such occasion allowed (I hypothesized) some leakage between the universes. The madman seemed to be possessed of vast reserves of strength, and it came to me that perhaps he fed off the energy field in some way, thus needing neither food nor drink. At last he settled in the hub of the wheel next to mine—I had to peer over the edge to see him. He released my bot so it floated by his side, and waved something small and white at me—it was my knotted handkerchief, with my roasted gram and sweet suttoo! He opened the handkerchief and began to eat, pushing the food through the membrane in front of his mouth, at the same time making the most insane—even lewd—gestures at me. This so infuriated me that I began to yell and scream—uselessly across the void—and to wave my arms about in a fury. He seemed to enjoy the display, and after he had finished his repast, grabbed the bot as though to toss it to me. I held my hands out, but he flung it—not quite toward me, but toward one of the spokes of my wheel. I saw him launched into space in the opposite direction by the action. He flew between the great wheels, getting smaller and smaller—indeed, that was the last I ever saw of him. I had more immediate problems to worry about. For the bot hit the edge of the spoke and careened away, breaking up as it went, causing my wheel to shudder and spin faster. Immediately I sensed the delicate energy field being distorted, tearing like a rubber sheet that has been pulled in a weak spot with excessive force. Voices screamed in my mind, and I saw a gulf of the other universe opening up before me like a giant mouth. The scene before me began to undergo fantastic optical distortions—my own wheel seemed to have gone liquid, like a new painting that gets runny if you spill water on it. But when I touched the wheel, it was still smooth and hard. Then it came to me that restoring my wheel’s normal spin rate was quite a simple matter. I remembered how I used to spin in my father’s swivel chair as a child, stretching out my arms when I wanted to slow down. I began to crawl up one of the spokes of my wheel, being careful to do so slowly. I had to move just the right distance along the spoke so that the increase in rotational inertia would cause the angular velocity to decrease. I did not even know whether my mass was large enough to affect the rotational inertia of the wheel. But as I moved, I felt the wheel slowing down, until suddenly everything seemed to lock into place. The energy field was restored, the distortions ceased. The great dark mouth of the other universe closed. I stopped where I was, sweaty with relief, thanking all my physics teachers that I had remembered the conservation of angular momentum. I knew, of course, that I would have to stay here for all time, but at first I felt little regret. The energy field would keep me alive, perhaps for eons, and my mind would, in time, learn to communicate with the sheath that protected me from my surroundings. Still, I felt a pang, because I would no longer be able to tell my fellow human beings about my great discovery. I would never see the blue skies of Earth, or eat roasted gram and sweet suttoo again. I admit that I felt tears well up in my eyes. Time passed without impressing itself on me—what need had I of time? I must have fallen into a stupor, then, that perhaps lasted weeks or months. I dreamed of strange beings, other worlds. In one dream I was lying on my spoke, gazing at the apparently infinite array of wheels, when I saw an injured moth flying from wheel to wheel, coming toward me. As it approached I saw that it was a very strange moth indeed, with enormous, delicate, gauzy wings, one of which was held only half opened. Its two foreshortened arms waved at me, as the long, thin, frog-like hind-limbs crouched for the next leap. It seemed to skim the surface of the energy field like a water-skating insect. And then it was floating before me, its smooth, triangular head bending close. Around this time the realization slowly dawned on me that this was no dream. Upon the creature’s head was an array of small, bulbous organs that lit up in complex patterns, conveying some message to my fevered mind that I could not yet understand. The creature had evidently sustained some damage from the disturbance in the field, because one of its wings, I saw now, was tattered at the edges, explaining its lopsided flight. The creature’s message must have ultimately soothed me, because I fell into a deep sleep. I remember half-waking at various points, and seeing before me the rounded cave, deep within the cliffs of Mars. I remember fumbling with my environment suit and picking up something white off the ground. I must have staggered through an infinity of dark passageways, led by a persistent voice in my mind, until at last I saw light ahead of me, and fell to the ground in a faint. When I opened my eyes again, I was lying outside the cliff face in the middle of a dust storm, clutching my empty handkerchief. How it came back into my possession I cannot say. In fact it is this very handkerchief you see now. I must have staggered around, light-headed for a while. As the dust storm ebbed, my senses seemed to clear as well; I found myself hopelessly lost, with no sign of the opening in the cliff. Then I remembered my suit’s radio. The sound of a friendly human voice lifted my spirits beyond imagining. A team from Base rescued me and took me to camp, where I told them my fantastic story. Of course they did not believe me, but they did go back to where they had found me. They could not find the place where I had emerged from the cliff, nor did they find any evidence of the madman. Finally they put my story down to hallucinations brought about by lack of food, water and human company. What could I do? There was no proof that anything strange had happened to me, except for one thing. I believe that the moth-like creatures, whatever they were—caretakers or simply beings who fed and lived their lives in the great energy field—somehow restored the correct functioning of the wheels. Because after I returned, the anomalies stopped occurring. So much so that scientists who had observed them began to doubt that anything unusual had ever happened. The anomalies were not observed again until all these years later. Now they have been seen on Mars, on the Moon, and even on a spaceship en route to Mars from Earth. The return of the anomalies must mean that parts of the mirror universe are pushing through into ours—that the great field of wheels has suffered a serious disturbance. What could be the cause? Perhaps the madman is on another rampage. Perhaps… who knows? That is more or less the end of my story. I was sent back to Earth for a rest, but since the stars kept calling, I didn’t stay there long. I tried, sometimes, to forget what I had gone through, but there was a constant reminder, the souvenir I carried with me. What? I haven’t told you what it was? Here, I will show you. Let me roll up my sleeve. See this little white patch? Feels like smooth plastic, doesn’t it? It’s all that is left of the sheath. When I returned to the cave-room where I had left my environment suit, the sheath fell off my body, except for a large patch on my forearm. I think this is what guided me through the passageway in the cliff, at the end. Over the years it has kept shrinking, but even now, if I concentrate, I can hear bits and tatters of the music of those great wheels as they spin endlessly in space. She surged to her feet and poured a fresh cup of tea for Sahai-ji, all the while looking at him in wonder. “What a great thing for Bihar!” she said cryptically, and went out of the room to see to dinner. Meena shook her head, as though to clear it of a spell. “Anti-photons!” she said ecstatically. “Aliens! Great wheels of space and time! Oh, how wonderful!” She seemed incapable of saying any more. I looked at Dave. His eyebrows had nearly disappeared into his brown thatch of hair. Sahai-ji popped a ball of suttoo into his mouth. “What about the patch on his arm, then?” I said. “It probably was a bit of tamarind chutney,” I said. Kunaal turned from the doorway. He seemed surprised that Meena’s pimple was gone. But we were even more surprised when we saw his face. “It’s on your face now,” Dave said, in a tone of gentle wonder. Sahai-ji shook his head sorrowfully. “Look in the mirror,” he said. © 2012 by Vandana Singh. Originally published in The Woman Who Thought She Was a Planet. Reprinted by permission of the author. 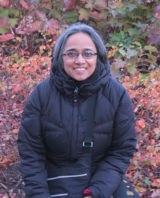 Vandana Singh is an Indian science fiction writer and professor of physics currently inhabiting the Boston area. Her stories have been published in numerous venues, including reprints in several Year’s Best volumes. Her second anthology of short fiction, Ambiguity Machines and Other Stories will be out from Small Beer Press in February 2018. This story is her humble tribute to Premendra Mitra (1904-1988) a renowned Indian SF writer, and was first published in an earlier short story collection, The Woman Who Thought She Was a Planet (Zubaan/ Penguin India 2008). For more about her, see vandana-writes.com.